Freezy Freakies Gloves Are Coming Back! Kids of the '80s, rejoice! Freezy Freakies, the gloves that changed color to reveal hidden images in the cold, are back—and in adult sizes, for the first time ever!—thanks to a Kickstarter that's already raised much more than its $10,000 goal. The key behind the magic was Thermochromic Ink, an ink that changes color with the temperature. Transparent at room temperature, the ink becomes more colorful as temperatures drop. Twins Hans and Karl of Buffoonery Factory LLC put on the Kickstarter after years of searching for the gloves as "(sort of) adults" without success. "We realized two things: 1) they’ve been out of production for a while, and 2) they were never even made in adult sizes," they write. "The other glove brands that have survived since the '80s all seem to have matured in their styles, regardless of the fact that many of us did not. Totally uncool, right? Well the solution became clear: we had to bring back Freezy Freakies in their original '80s designs, adding some more modern materials for comfort, and in adult sizes for the first time ever." 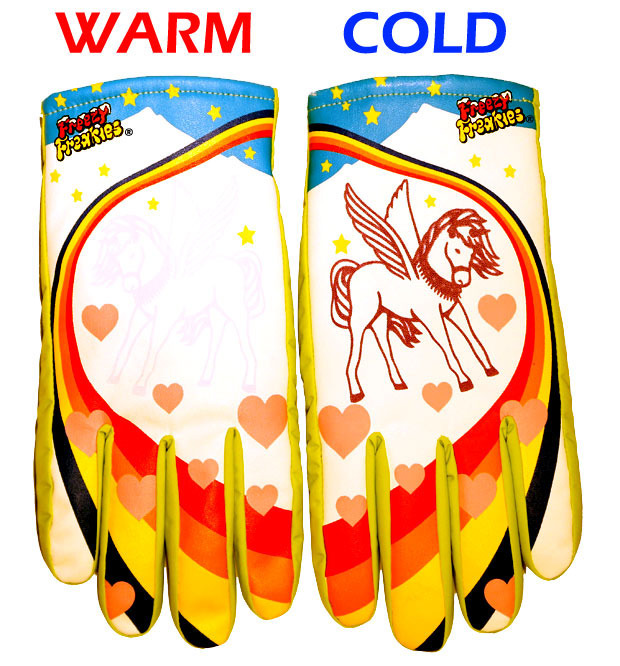 Pledging $29 will get you the Freezy Freakies gloves of your choice. Now all I need is for someone to bring back hypercolor shirts and I'll be all set.